Rebloggled from the Cathy Fox blog on child sexual abuse. A most moving book. I cried about 20 times during reading the book. 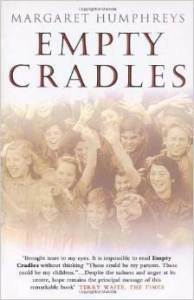 It is the story of how Margaret, a social worker for Nottinghamshire County Council gradually discovers the unpalatable truth that the British Government and childrens charities trafficked children as young as 4 to Australia, New Zealand, Canada and Rhodesia. It was part of a deliberate policy to rid Britain of the problem of full childrens homes, paying for their upbringing as well as having the “benefit” of populating the Empire with young white blood. These children were transported as orphans, often with names and dates of birth altered so that their parents, who had often not agreed or even known about the theft of their children, would not be able to contact them and vice versa.